Ecolibrium Solar's UL 2703 testing lab is "a monument to the relentless process of simplification," according to Editor Chris Crowell in Solar Builder Magazine's January edition, which features the company's Boulder, CO testing lab and process. In addition to testing prototypes, the company tests to qualify PV modules with their racking according to UL 2703 standards. 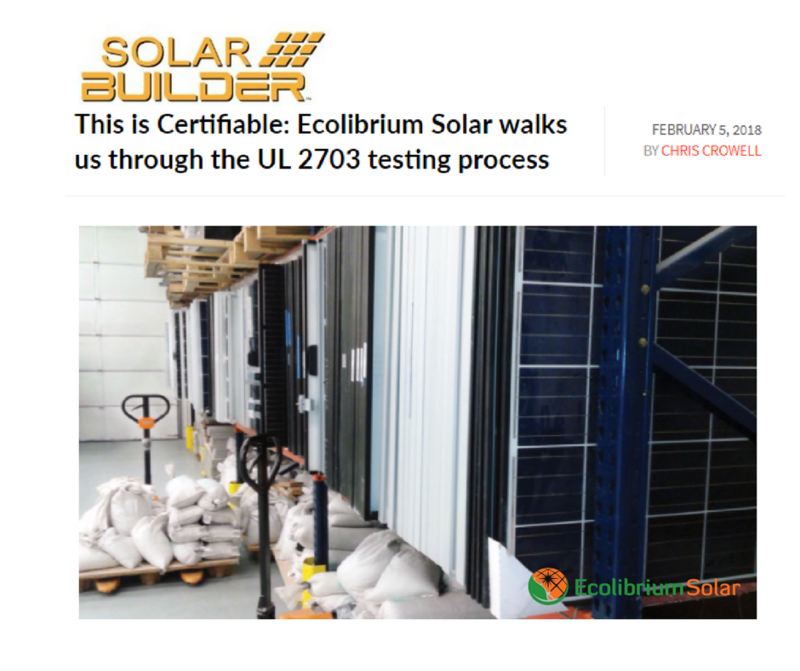 Reporting on a recent tour of the company's Boulder, CO facility, Solar Builder Magazine Editor Chris Crowell discusses why Ecolibrium Solar's UL 2703 in-house testing speeds product development and the certification of panels. As panel supply fluctuates, responsive panel certification is increasingly important as installers strive to find available panels to complete jobs. The listings enable customers and plan reviewers to see if the module specified is approved with Ecolibrium Solar commercial and residential racking. UL 2703 listed panels also make the inspection process go smoothly and quickly. Ecolibrium Solar's Boulder facility is a certified UL 2703 testing partner lab of TÜV Rheinland Group. The company test new modules regulary and over the past 7 months has added about 109 moudules to their growing list of PV panels that meet UL 2703 certification when installed with the company's racking solutions. Having an in-house testing facility keeps costs down during product development and testing, as well as helping control the development timeline. This is particularly significant as Ecolibrium is dedicated to creating the simplest and fastest-to-install racking available. The feature article can be read here.